Old Rishworthians’ worries near the foot of Yorkshire One were increased by a 24-22 defeat away to fellow strugglers Hullensians. The Copley men could and perhaps should have won, but will look back on a disastrous opening 15 minutes in which they went 13–0 down. A poor kick-off handed possession to the home side, who forged into the visitors’ territory and gained a penalty for a three point lead. 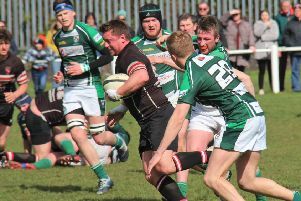 Rishworthians fought back with a good move but eventually lost the ball and the home men brought it back upfield, retaining possession until a missed tackle allowed a break which was finished off by the scrum half. The conversion made it 13-0. It was the spur the visitors needed and they started to dominate possession and threaten the home line. Rishworthians failed to deal conclusively with the restart and the home side attacked again. The ball was switched back and a mismatch brought a second home try wide out. Another poor restart kick was called back for a scrum, with possession going back to Hullensians, and Rishworthians were under pressure again and conceded another penalty. This time they came back strongly from the restart, with Ethan Pollard winning the ball. It was recycled well and was fed out for centre Ben Waud to crash through for an unconverted try to make it 21-12 at half time. The second half was a different story and belonged mainly to Rishworthians. There was some excellent tackling from Pollard, fellow flanker Toby-Muscat-Baron and wing Doug Heseltine. Scrum half George Wright made some good breaks and, when Ed Cockroft came off the bench for his first start of the season, play started to quicken. Waud was stopped a couple of times when he looked likely to score and the last pass did not go to hand as Rishworthians pressed. They kept up the attack and were pushing the home men back in the scrum. Near the line they won a scrum against the head and attempting a pushover gained a penalty try. Cockroft kicked them into the lead with a penalty, but Hullensians came back and pressurised the visitors’ line. Good defence denied wave after wave of attack but eventually a penalty allowed the home side to retake the lead in the final minutes and hold on until the end.